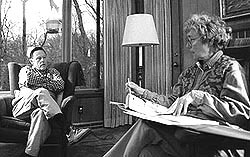 Hindman, left, talks with his wife, Axie. Perhaps it is not surprising that the man who was the driving force behind the creation of the MKT and Katy Trails would spend part of his summers at a cottage in rural Minnesota. Hindman’s love of life and of the outdoors is something that shows through not only in his former environmental activism but also in his day-to-day life. The Hindman home is located just west of West Boulevard in central Columbia. On top of a hill, the house is a multi-level dwelling that looks like it was inspired by Frank Lloyd Wright. It appears to be set into the hillside, with the top floor at street level and the bottom floor on the side of the hill. The large-paned windows in Hindman’s bottom-floor study look down the hill through a virtual wilderness of trees and flowers. Abutting the study is a small concrete patio with two handmade squirrel feeders. Beyond the patio, the land is wild, with only the hint of a foot trail sneaking through it to indicate that someone has been through. Hindman inherited the house from his father, who had it custom built. He has since bought several of the surrounding properties, which lie intentionally undeveloped. Thus, he has behind his house his own urban greenspace, an unofficial "Hindman Trail." Hindman takes Susie, his golden Labrador retriever, for a walk on the trail every morning and most afternoons. 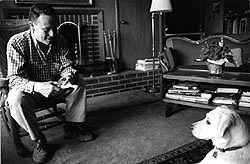 Hindman with his dog Susie in his west Columbia home. It’s Sunday, one week after the Moo Dah parade, and I am visiting the Hindman home. After introducing me to his wife Axie and his dog, Hindman takes the three of us for a walk on the Hindman Trail. Or rather, Susie takes us for a walk, since she leads the way. The trail winds down the hill and then runs parallel to a creek that lies at the bottom of the hill. As we go along, Axie points out several different flowers, among them Dutchmen’s breeches, spring beauties and jonquils. "And those are about the three I know," she says. But later, she points out violets and blue bells and May flowers. Axie tells me that their kids, Skip and his older sister Ellen, used to go out on the trail when they were younger because they thought of it as a way to be away from all parental supervision. "And for all intents and purposes, they were," she says. Meanwhile, Susie is leading us along the trail, playing in the water of the creek, wrapping her leash around the various bushes and trees. Hindman untangles it and lets the dog lead him along down the path. About halfway through the trail, we come to the backyard of another house. The neighbor’s dog runs out toward Susie, barking and growling, teeth bared. Susie, who is only a year old, attempts to play with the other dog. Although he is holding Susie’s leash, preventing her from straying too far into the neighbors’ yard, Hindman does little to keep Susie and the other dog apart. "Oh they’re just playing," he tells the neighbors as they come to restrain their dog. They neighbors try to get their dog to back off of Susie, and finally – after putting a leash on it – succeed in doing so. Story, photographs copyright ©2002 Troy Wolverton.